I'll go ahead and admit that I turned off the DVD for the first Thor film less than halfway through. So it's safe to say that I walked into this third installment with little to no excitement (and this is coming from someone who actually enjoyed 2012's The Avengers). It'll be to the relief of many Thor fans that Thor: Ragnarok maintains a welcome playfulness that more or less keeps it buzzing along for most of its running time. There are certainly some laughs to be had, but I don't know how I feel about a Marvel superhero movie depending on the DNA of a comedy as opposed to the DNA of an exciting and involving action epic. But that's an entirely different conversation for a different time. Taking a cue from this year's far superior Guardians of the Galaxy Vol. 2, Thor: Ragnarok banks on the nostalgic appeal of everything retro, from using Led Zeppelin's "Immigrant Song" as its musical theme to the art direction of the planet Sakaar, which looks like the digital world of Tron crossed with all of your favorite arcade games from the 1980s. Oscar-nominated filmmaker Taika Waititi (Two Cars, One Night) is at the helm here and his biggest success is making Ragnarok peculiar enough to stand on its own, so viewers who haven't seen the first two Thor films (like me) aren't going to be dizzy by too much exposition explaining past storylines. 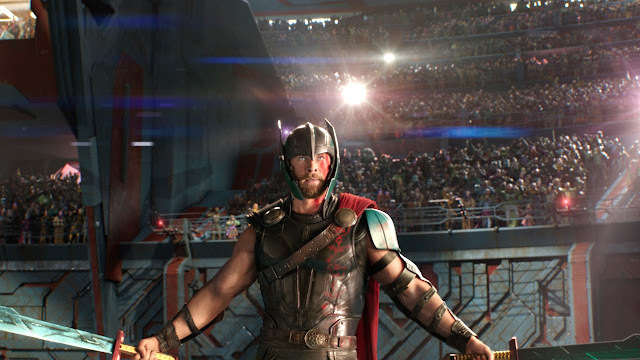 The screenplay by Eric Pearson, Craig Kyle and Christopher Yost has Thor (Chris Hemsworth) and his shifty brother Loki (Tom Hiddleston) getting muscled out of Asgard by their murderous evil sister Heli (Cate Blanchett, absolutely killing it in her costume) and stranded on Sakaar, an alien planet run by Grandmaster (Jeff Goldblum). Thor's introduction to Grandmaster is straight out of Willy Wonka and the Chocolate Factory, and rightly so. Goldblum's Grandmaster has the ticks and mercurial wide-eyed fascination that Gene Wilder pumped into his titular role. In fact, Goldblum is the best part about this film. He's like a looney character from Luc Besson's The Fifth Element. I wish the film had been about his day-to-day operations as the ruler of Sakaar. But I digress. On Sakaar Thor is imprisoned to be a gladiator. It's thanks to the film's marketing campaign that we know Thor will be forced to fight his fellow Avenger the incredible Hulk (Mark Ruffalo). Hulk has been in rage cage, Hulk-smash mode since we last saw him in Avengers: Age of Ultron a couple of years ago. I suppose this is the film's centerpiece and it throws in a punchline that pays homage to Loki's memorable confrontation with Hulk in The Avengers. It's an entertaining section and it offers a hint to what the "Planet Hulk" movie would've looked like. Eventually our heroes have to team up and escape Sakaar in order to battle Heli back on Asgard and the film loses steams when that happens. But while the story has Thor under the thumb of Goldblum's Grandmaster, Ragnarok banks on the visual gags and absurdity that Sakaar provides aplenty. And I'm betting those laughs and highlights will turn into satisfying dollar signs at the box office for Marvel come opening weekend. I just wish the film had a closing title-card that read "Jeff Goldblum will return in his own spinoff movie." zmovies - As we all see, Marvel is finding its style on every each of its movie, which is, for cash we spent to see them, we really had great times, laughing loud. A brilliant idea from Marvel, how superheroes are still human with common senses. They sometimes go reckless, silly, scared, hopeless, desperate, making fun to each other. This idea won't stand a chance at first, no place for vulnerable, or worse, joking around superheroes. It is about strategy, to be different, unique, and lasting longer, last but not least, for how fun the audience inside theater and after. Well done! Review: "The Killing of a Sacred Deer"
#FreeCinemaNow has a new look!